Over the last few days, uncertainty regarding Brexit has increased the perceived risks of investing in the UK market. As we have a large weighting towards large blue chip UK companies, we thought it may be useful at this time to explain the investment thesis behind one of our large holdings. 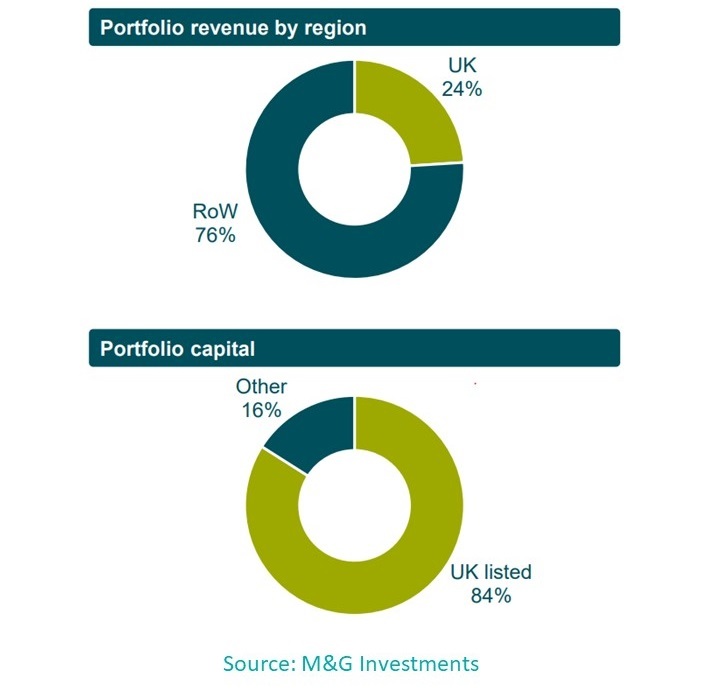 The M&G Recovery fund has 84% of its holdings listed in the UK. All this means is that 84% of the fund’s equity holdings are in companies that have their main listing in a UK exchange. As shown in the diagram below, the vast majority of revenue generated by these companies comes from outside the UK. Our holding at first sight could appear counterintuitive. After all, why invest in the UK at a time of uncertainty due to our unclear relationship with the EU? The large revenue stream coming from outside the UK means the success of these companies is not directly correlated to the strength of the domestic UK economy. However, the negativity in the media together with general investor pessimism has significantly depressed valuations in these companies. We believe these to be unwarranted and that they’ll be revised once the merits become appreciated by the market. Secondly, these large multinationals can act as a hedge against movements in the currency. For example, in the event of a hard Brexit, the sterling will likely fall in value. This will make UK exports cheaper and more competitive abroad. But this could also increase the cost of raw materials and put pressure on profit margins. But the structural advantage of these large blue chips is that they have extensive experience operating in foreign markets and many of them hedge their currency exposure. This allows some of them to have their cake and eat it, to borrow that topical saying. A decline in sterling will likely increase revenues by making prices more competitive abroad without a decline in profit margins caused by rising raw material costs. These are some of the reasons we find large multinational UK stocks attractive investments considering the uncertainty created by Brexit. Their performance is weakly correlated to the strength of the domestic UK economy, but no one wants to own them and in investing, uncertainty and pessimism often create opportunity.